I’m guessing that one of the more unusual things about our trip to Kenya was the documentary film crew that traveled with us. I’ve failed to mention it here, though these photos were originally going to be part of a blog post way back in April…. But I ran out of time. Yes, Fourth Line Films accompanied us to do a story on our trip. Nate and John became part of the team, really, though it took some getting used to at the beginning to have cameras always rolling and large microphones hovering in the room. They filmed us as a means of creating a series of films about what it looks like for Americans to go on a mission trip in Kenya; interestingly, our story has a partner series: what it looks like for Kenyans to go on a mission trip in the U.S.
Every documentary usually has focal points, and Nate chose our family as one of those points. The crew came to Trinity School to film me teaching one day; later they followed our family to William’s ball game; and finally, one Saturday evening, they interviewed Bill, me and our entire family at our house. 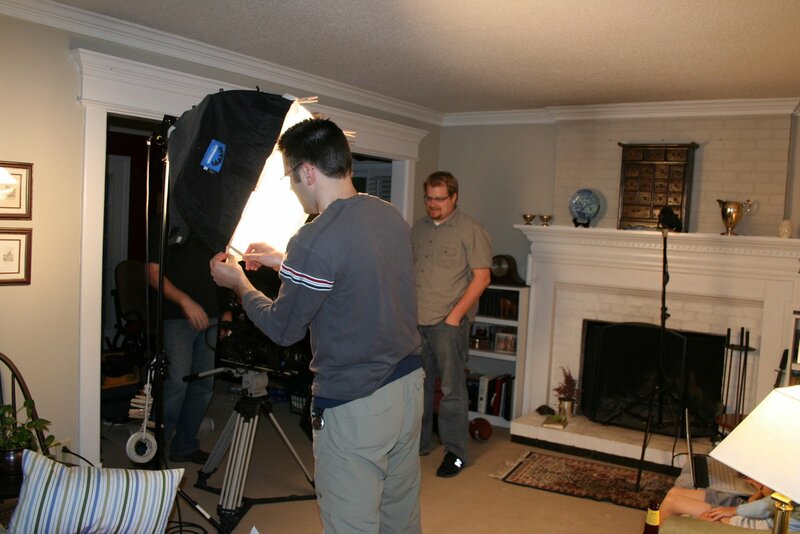 That’s what you’re seeing here: the living room transformed to serve as film studio. The lights they used were Really Something. The dust in my living room was Impressive, and I realized in a Whole New Way how much we were in need of new carpet. Last Sunday, our Kenya/Tanzania team gave a little presentation after church to let our many sponsors know what we did and, perhaps, to interest others in making a similar trip someday. Nate and Jeff of Fourth Line Films came back to Chapel Hill for this event, and Nate brought a short video he produced from our trip. We all enjoyed seeing it. Each of us said later how watching that film brought the whole trip back. It’s hard to believe that it’s over, and that we’re already home. Here’s a link, if you’d care to see it. Fourth Line Films. Remember that name.